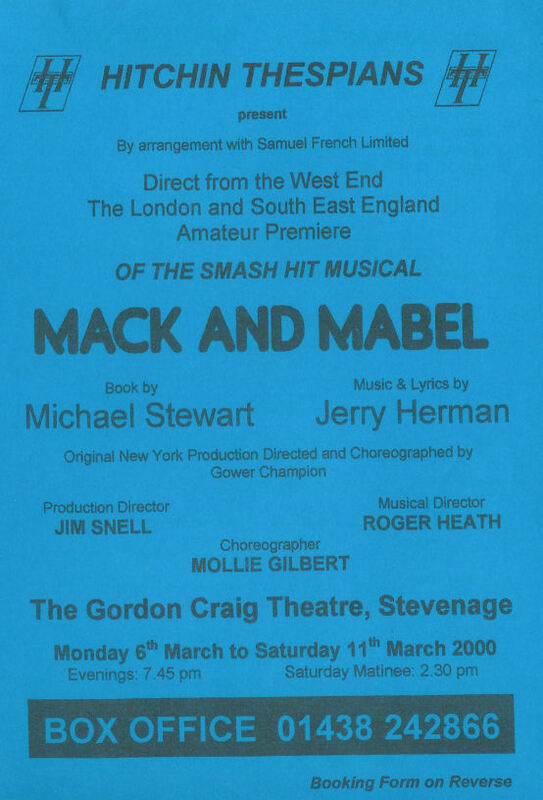 The Hitchin Thespians are pleased to announce their production of Mack & Mabel which will be performed at the Gordon Craig Theatre, Lytton Way, Stevenage from 6th to 11th March 2000. This classic show, inspired by the lives of two celebrated personalities from the pre-talkies age, promises a memorable first for both the Gordon Craig Theatre and the East of England amateur stage. Jim Snell will produce the show, with musical direction by Roger Heath. The plot is based in 1928, at the onset of the "talkies" era and flashing back through the years since 1911. The show opens with Mack Sennett, a comic actor-come-director, back in his old studio reflecting upon the past. He first encounters Mabel Normand as she delivers sandwiches to the set amid the melee caused by creditors trying to close it down. Mack admires the character of a woman refusing to leave without due payment and in time falls in love with her. 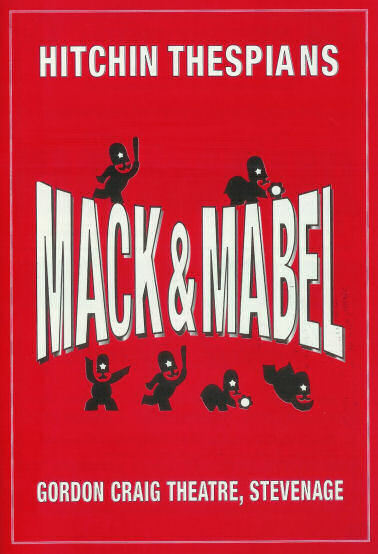 Mack turns Mabel into a silver screen star but their relationship is based upon the rocky foundation of Mack's consuming love of making movies. Sennett uses her and eventually she leaves him, persuaded by the famous director William Desmond Taylor to make a movie with him. But the idea is not a good one as she screens a sequence of bad movies. One morning she returns to Sennet's studio to give it another try, but Mack's resolve to shoot a movie for her is broken by his latest discovery: the Keystone Kops, and she walks out again. Back with Taylor, this time things get even worse for Mabel as her lover is murdered. Finally, back to 1928, Mack realises that Mabel really needs him this time and now he is ready. He will make the movie; and just like the old times, Mabel will be a star! Musical Numbers include: "Movies were movies", "Look what happened to Mabel", "Big Time", "I won't send roses", "So who needs roses", "I wanna make the world laugh", "Wherever he ain't", "Hundreds of girls", "When Mabel comes in the room", "My heart leaps up", "Time heals everything", "Tap your troubles away", "I promise you a happy ending". The Broadway opening was on 6 October 1974 at the Majestic Theater, New York City: it ran for just 66 performances. Directed by David Merrick and choreographed by Gower Champion, the cast included Bernadette Peters, Robert Preston, Lisa Kirk and Stanley Simmonds. In the UK, interest in the show was aroused in 1984 when Torvill and Dean used its Overture as accompanying music in their bid for Gold in Olympic Ice Dance. Since then, music from the cast album has been popularised on the radio by one of its staunch supporters, David Jacobs. The London opening on 7 November 1995 heralded the start of a longer West End run. 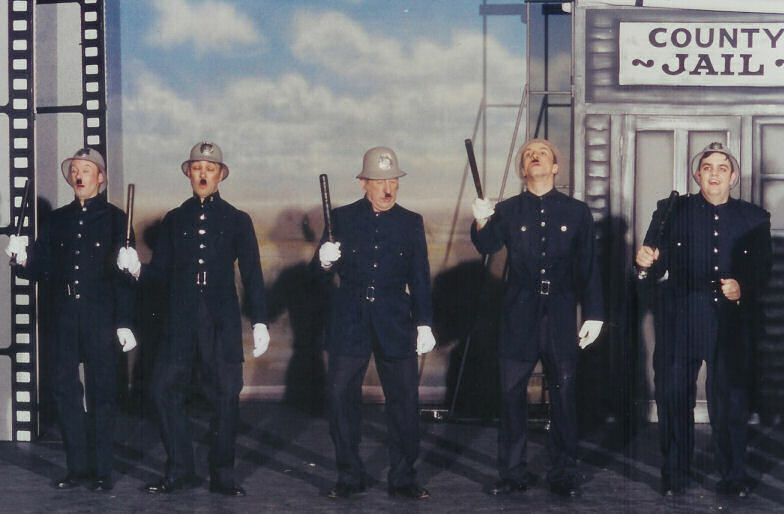 It was directed by Paul Kerryson (one of Hitchin Thespians' previous producers!) with Julian Kelly as Musical Director. 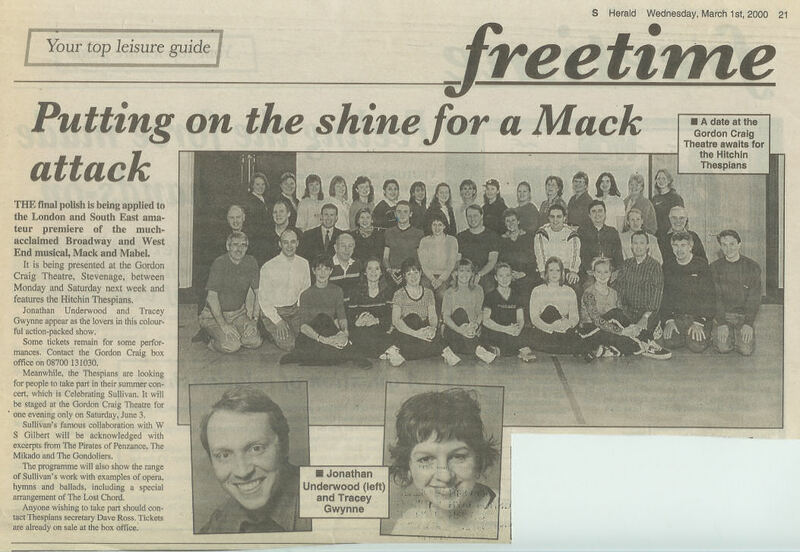 It starred Howard McGillin as Mack, Caroline O'Connor as Mabel and Kathryn Evans playing the part of Lottie. 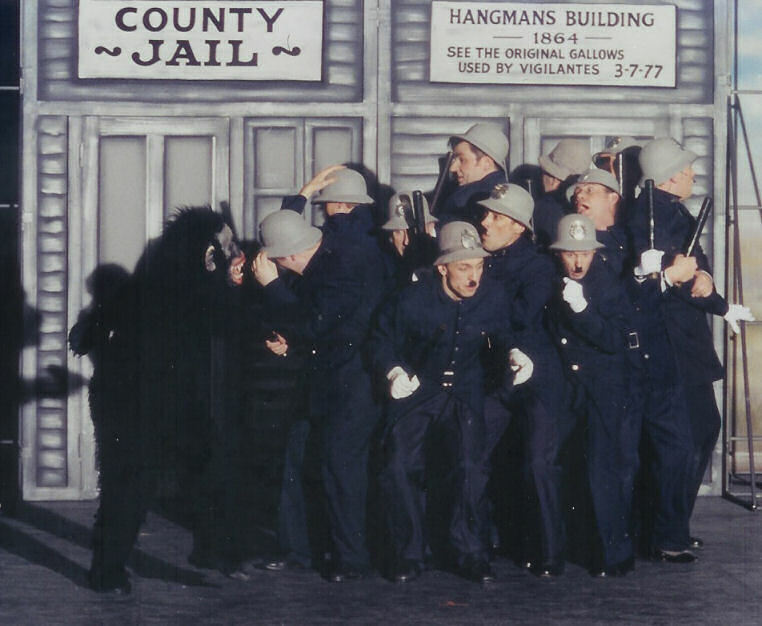 This production saw a revision to the original book with a less sombre ending (not mentioning Mabel's death in 1930 as the previous one had) and the addition of two new songs "Mack & Mabel" and "Hit 'em on the head".